QP First made in 1925, Kewpie has a richer, creamier flavour than your usual mayonnaise due to its exclusive use of egg yolks and a mix of apple and malt vinegars. Kewpie comes in a large squeezy bottle to make it easy to pour on to your favourite dishes! 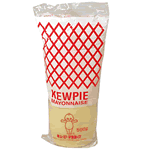 Kewpie is a hugely popular condiment in Japan used in all manner of cooking such as toppings for yakisoba, okonomiyaki and takoyaki, dipping sauce for kara-age and a replacement for butter or oil when frying vegetables, meat and seafood. Kewpie is THE Mayonnaise of Japan. Vegetable Oil (Soy Bean), Egg Yolk, Vinegar (Apple), Salt, Seasoning (Amino Acid, MSG), Spices, Spice Extract.